February has been unusually cold this time, we're expecting a -11 degree next week. Some of you may disagree and call this normal - but my time range of comparison is the past two years and those years were much better than what we're experiencing right now. Now for an update from my end.. In a few months, our stay in Erlangen is coming to an end. The project which DH is overseeing right now is going to be completed and we're packing our bags back to India..Yooohoooo.. When I convey this piece of news to our acquaintances here - a question that is commonly asked is - aren't you sad to leave? And that surprises me. Why would I be sad to go back to my homeland? We came here for an experience and we enjoyed it while it lasted, but we are not desperate to stay here. I am aware of many expats who're trying very hard to land a job here and continue with their lives here. We did have an option to go for permanent residency, but we decided against it. It is purely a matter of choice. Of course, this place is beautiful, peaceful and clean ; but our hearts are happiest when we are in our own home. Thus the last month has been one of taking stock of what to take back and what not. We still have a couple of months here but our apartment here has already been booked by the next tenant - there appears to be a severe shortage of residences for people who're new to this place. So, that's the bit of news. Now for the completed projects.. 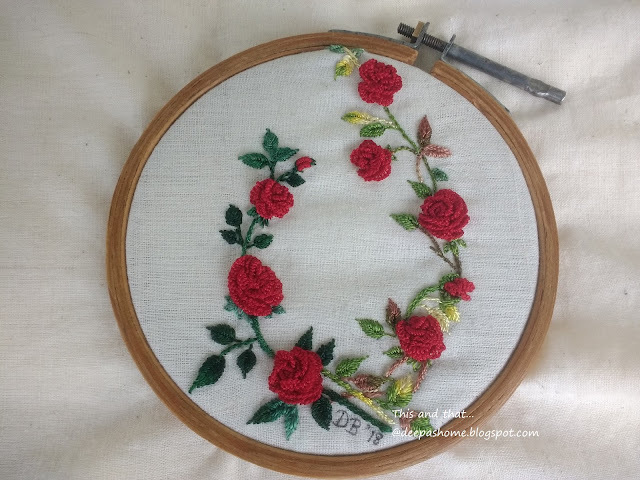 I stitched up roses again, this time a little more elaborately. I know - you may be exclaiming - What, roses again??!! It did turn out as I had imagined, except for the fabric. 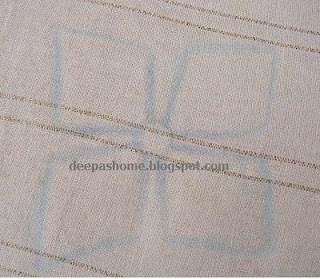 I tried embroidering on Malkha - which is a mix of Mal-mal and Khadi and is popular as a wearable and is excellent for summers. And here's my attempt at framing. The region inside the floral loop looks so because of the thinness of the fabric - but otherwise it is framed tight. Do you think a darker, plain frame would've been better? I have not used glue or tape and changing the frame would be very easy. I am planning to give this as a parting gift to one of our friends . Hopefully it'll be liked and appreciated. Your stitching is beautiful. 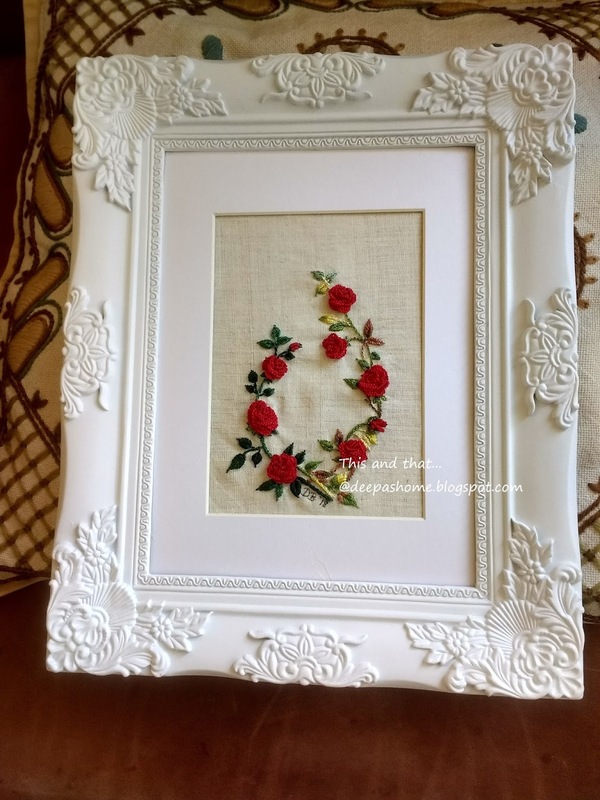 You have found the perfect frame for the roses. I found the question of you being sad to go back home odd. I think my country is great and I know very little about India. I have a few friends and acquaintances who are Indian living in the USA. It seems to me that they travel home to visit every chance they get. I'm glad to hear you love your Homeland and glad to hear to will be able to return to it. Of course if there are conditions to live in. Unfortunately many countries are in war and don't have conditions for both children or adult and that is so sad! Be happy and join all the things you have no access in India - I guess you'll be very busy next months! Good luck with the move! I’m in the same boat, though I’m not as keen on going home. But, it will all work out I’m sure. 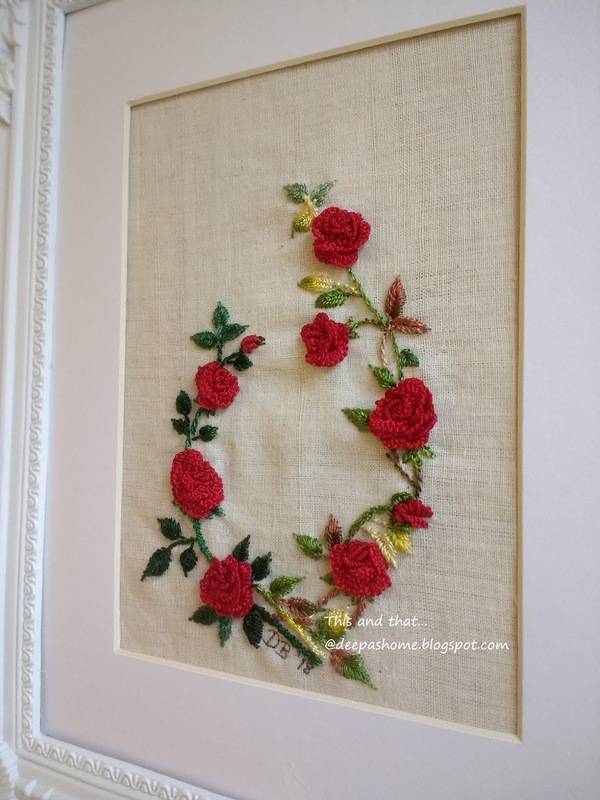 I love your roses, and think the fancy frame suits the design well. A very special gift! Of course you should take joy in returning! You have your roots in Inada and you have your family there. Your roses are always a delight to see, and I hope you will continue to make them and blog about your embroidery. I am sure your friend will appreciate your parting gift. Often people can't imagine a better place to live than their own home town, so it doesn't occur to them that you might prefer your own home to theirs! The frame looks very beautiful as well as the roses. What a wonderful gift, Deepa! I think your roses came out beautifully. 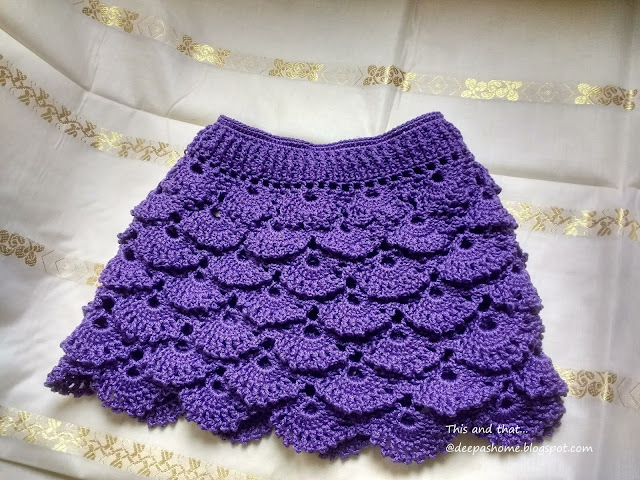 And, that little skirt is adorable! Is is from a pattern? Do you have a link for the pattern? Your embroidery is beautiful and the frame is very pretty! :) I use a same coloured fabric backing for my pieces if they are very delicate, it not only gives more strength to the piece to frame but is also useful to hide the background. So glad that you're happy to be returning to your home. I remember when you were packing up to move to where you are now and the changes you went through once you were there. To answer your question regarding the framing of your beautiful roses - I wonder if the mat could be a darker colour? On my computer it looks very white so maybe if you tried something a wee bit more on the ivory side you might like it better? Maybe you could try wrapping the mat with some fabric?